Ghilarducci’s comments appear in The Week, a weekly news magazine, as part of an informative piece (“The not-so-golden years,” April 27 edition) spotlighting a largely neglected Boomer retirement savings crisis that has grave implications for America’s social and economic well-being. While the economic meltdown is one reason for this crisis, the more systemic cause is the disappearance of the traditional pension plan. The Week reports that from 1980 to 2006, the percentage of private-sector workers with employer-funded pension plans dropped from 60 percent to 10 percent. The 401(k) plan — voluntary and largely employee-funded — would replace the pension as the primary retirement savings vehicle. Unfortunately, most workers have not built 401(k) accounts sufficient to fund a comfortable retirement; the average 401(k) balance “is just over $60,000,” according to The Week. Even worse, “(m)ore than half of U.S. workers have no retirement plan at all.” Social Security payments “averaging $14,780 a year for individuals and $22,000 for couples” won’t bridge the gaps. Consequently, it appears that many Boomers will find themselves working much later into their lives, seeking cheaper housing, and cutting back sharply on spending. From a policy standpoint, there are no easy choices. Below are two possibilities; the first is something of a pipe dream for now, the second is more politically viable. Rather than curtailing public and private pensions, New York and other states could save millions of workers from impending poverty by creating public pensions for everyone. While the recession bears some blame for the looming retirement crisis, experts agree that the primary cause is more fundamental: Most workers do not have retirement accounts at work. At the very least, we need to ensure the viability of Social Security for generations to come. The anticipated shortfalls in the Social Security fund can be addressed by raising the current cap on payroll taxes that fund the system. Currently workers pay a flat 6.2 percent in payroll taxes, but that tax caps out on the first $106,800 of income. Eliminating or raising the cap would go a long way toward keeping the Social Security fund in decent shape in terms of paying out promised benefits. The other option for Social Security is means testing, which would reduce or eliminate benefits for the most economically fortunate. The politics of this possibility will certainly push the “class warfare” buttons, but it wouldn’t surprise me to see proposals enter the picture as the crisis becomes more evident. In addition, there’s a potential political war looming in the not-so-far distance, one between the Boomers now facing a bleak retirement and younger generations trying to get their starts in life. It is fair, for example, to ask people entering the workforce and starting a career to bail out their elders, while facing a brutal job market and carrying enormous amounts of student debt? As I wrote in this short article two years ago, generational battles over taxation and public spending may become ugly and divisive. Also, this won’t be solved by older Boomers suddenly deciding to save more, even assuming they are in a position to do so. Retirement funds are built by accruing returns on principal over time, and five or even ten years isn’t a sufficient period to do so, especially at a time of declining interest rates. In addition to the individual burdens, the economic ripple effects of so many Boomers going into spending lock-down mode will be significant. What happens when a generation that built an economy based on credit and consumption suddenly puts on the brakes by sheer necessity? We may be about a decade away from finding out. Folks, it’s not a pretty picture, but I won’t apologize for sounding like a broken record about it in the pages of this blog. It’s a crisis we’d better face earlier than later. The full print version of The Week article is not available online, but a shorter version along with other pieces on the retirement crisis can be accessed here. For more articles from this blog related to retirement readiness, Social Security, public pensions, and the economy, go here. Meetings can chew up your life, eviscerate the blocks of time you need for writing and thinking, and mentor you into oblivion. They can be good if they’re focused, and the best ones can build community…. But good meetings are rare. Toth nails a lot of the standard-brand personality mixes that can make academic meetings so exasperating. But she misses an opportunity to tie the proliferation of meetings to more fundamental shifts in academic culture. It is a well-documented trend that American colleges and universities increasingly are dominated by an “administrative class” that has been growing by leaps and bounds, even at schools that have cut, or sharply slowed the growth of, their full-time faculties. The addition of administrators is not, per se, a bad thing, especially when specific programs and initiatives require staffing and direction. However, the accompanying power shifts have gone too far in many institutions, leading to a diminution of faculty voice, along with soaring budgets that often are paid for by students via higher tuition. All too often, these activities culminate in tepid reports or wholly predictable recommendations that are less than the sum of their parts. At times, the consequences are worse, with “groupthink” producing ideas that are downright batty or ill-informed. Perhaps there’s a case for all these meetings to be a chief activity for administrators, but they shouldn’t be for faculty. Nevertheless, if anecdotal evidence is accurate, this is a growing occurrence on many college campuses. When faculty are drawn into these spider webs of chatter, they often experience a huge drain on time and emotional energy, both of which are premium ingredients for successful teaching, scholarship, and (real) service. It means that the most important aspects of faculty work sometimes are lost amidst a sea of meetings and committee assignments, usually at the behest of senior administrators. For full-time faculty who might be reading this, here’s the question: Are there weeks during a typical semester when you spend more time in meetings with other faculty and administrators than in classes and meetings with students? If so, then there’s a good possibility that the administrative mindset has taken over your institution. One-world citizenship. A commitment to overarching human values and to a cosmopolitan identity as world citizens. Business and law. A recognition that what’s going on in certain boardrooms and law offices today may be more important — and more promising — than what’s going on in the traditional political arena. Consciousness. A recognition that values, virtues, attitudes, religion, and culture may have more to do with individual happiness — and social progress — than economic growth. One-world compassion. A refusal to accept that the well-being of people in Rumania or Nigeria or Malaysia is any less important than the well-being of people in Arizona. Ambition, achievement and service. In the Sixties it was a badge of honor to drop out. The strategy backfired. Today most socially committed young people are rushing to become doctors, lawyers, businesspeople, social workers, academics, and that is — or can be — a good thing. Kleiner’s Good Corporate Laws Meet Yamada’s Good Corporate Laws (2009) — Juxtaposing the work of business journalist Art Kleiner with my writings on worker dignity. Healing first! Time for the U.S. justice system to get less mechanistic and more compassionate (2008) — Writing in praise of therapeutic jurisprudence, the school of legal thought that calls upon us to frame the law and our legal systems through a therapeutic lens — a favorite topic of this blog too. Mediator-leaders: The leadership we need now? (2006) — Highlighting the work of mediator Mark Gerzon and suggesting that a new, more communal brand of leadership is needed. “Rankism” (the abuse of rank) — last big barrier to a just and decent society? (2006) — Drawing upon former Oberlin College president Robert Fuller’s (another favorite of this blog) call for a “dignitarian” society. Confronting the social causes of psychological depression: Too taboo? (2002) — Examining, among other things in this wide-ranging piece, the how workplace bullying can trigger depression, citing some of my early work and that of Gary & Ruth Namie. Some 20 years ago, when I was a young instructor in the first-year Lawyering Skills program at New York University, Mark’s name popped up on my class list. I had been a subscriber to his previous newsletter, New Options, and soon would learn that he closed it down and decided to pursue a law degree. We became friends and stayed in touch after I moved to Boston to accept a tenure-track appointment at Suffolk University Law School. 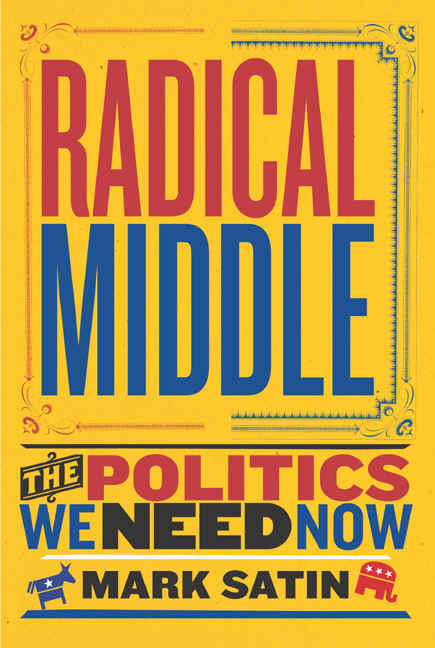 Eventually I would join the board of the non-profit organization he established to host the Radical Middle newsletter. After a few years, we had a friendly parting of the ways when I felt that my political views were further left to the middle ground he was defining. Fast forward to today: Although I identify myself as a liberal, Mark’s ideas have had a strong impact on me, to the point where I’m as comfortable in his defined radical middle as I am in the heart of mainstream liberalism. I am in agreement with him more often than not, and in any event I respect the voice he brings to our political and social discourse. Mark is working on a memoir these days, and I look forward to its publication. High-impact health promotion and wellness efforts … Workplace flexibility as a business strategy … Incentives and recognition … Preventing and addressing bullying and other counterproductive workplace behaviors … Lessons learned from award-winning companies … and more. Michael P. Leiter, PhD – Director of the Centre for Organizational Research & Development at Acadia University in Nova Scotia. With more than two decades of research on organizational behavior, Dr. Leiter is an internationally known expert on work engagement, burnout and civility in the workplace. David Yamada, JD – Professor of Law and Director of the New Workplace Institute at Suffolk University Law School in Boston. An internationally recognized authority on the legal aspects of workplace bullying and author of model anti-bullying legislation that has become the template for law reform efforts across the country. Bey-Ling Sha, PhD, APR – Associate Professor in the School of Journalism & Media Studies at San Diego State University. Dr. Sha is an award-winning public relations researcher, teacher and practitioner. Her research areas include cultural identity, international public relations, activism and gender. John Randolph, PhD, ABPP – Executive coach, consultant and board-certified clinical neuropsychologist in private practice in Lebanon, NH. A nationally recognized speaker on topics such as executive functioning, positive neuropsychology and leadership development. David W. Ballard, PsyD, MBA – Assistant Executive Director for Marketing and Business Development at the American Psychological Association, head of APA’s Psychologically Healthy Workplace Program. Matthew J. Grawitch, PhD – Chair of the Organizational Studies Program in the School for Professional Studies at Saint Louis University, an expert on healthy workplace practices. Larissa Barber, PhD – Assistant Professor of Psychology, Northern Illinois University, an expert on workplace flexibility and work-home boundary management, as well as work stress and health behaviors. It promises to be an interesting and engaging program. For more information, go here. 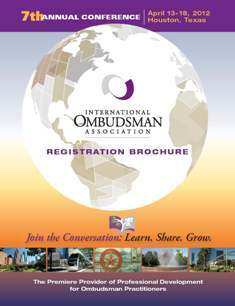 On Monday I had the privilege of delivering a keynote address to open the annual conference of the International Ombudsman Association (IOA), held in Houston, Texas. For readers unfamiliar with this position, an organizational ombudsman is a senior-level administrator who is granted an independent, neutral role to facilitate the resolution of interpersonal disputes and to engage in institutional troubleshooting. IOA’s membership is a mix of ombuds from colleges and universities (its largest group), government, and private industry, as well as independent consultants. The speaking invitation gave me a chance to address and interact with several hundred attendees about the challenges posed by workplace bullying. Based on the responses, clearly these issues present themselves frequently in their practices. My own remarks, a mix of “workplace bullying 101” and observations & advice specific to ombuds, were followed by a lively and informed Q&A session. In addition, at least two other programs at the conference (which continues through Wednesday) are devoted to workplace bullying, showing once again how this topic is entering the mainstream of contemporary employment relations. I’d like to thank the IOA and fellow attendees for this invitation and for their warm introduction to the organization. I regret that I was unable to stay for the entire conference, because I so enjoyed the day I was able to spend with them. Special thanks to ombuds Lisa Witzler, conference co-chair and my primary IOA liaison, for her guidance in preparing a talk that would be useful to IOA members. Conference attendees and others can access an extended outline of my keynote address, “Responding to Workplace Bullying: The Role of the Ombudsman,” here. During the Q&A, I recommended a piece by Drs. Linda Hartling and Elizabeth Sparks on organizational cultures. You can access a past blog post about it here, which includes a link to ordering the article. The IOA’s journal devoted an excellent package of articles to bullying behaviors in its 2010 issue, which can be accessed here. Especially for IOA members who may be visiting this blog, my 2008 article, “Workplace Bullying and Ethical Leadership,” may be of interest. It can be accessed here. Dignity is a birthright. We have little trouble seeing this when a child is born; there is no question about children’s value and worth. If only we could hold onto this truth about human beings as they grow into adults, if only we could continue to feel their value, then it would be so much easier to treat them well and keep them safe from harm. Treating others with dignity, then, becomes the baseline for our interactions. What if treating employees with dignity became “the baseline for our interactions” at work? How much would the experience of work improve, leading to a happier, healthier, more productive, and more loyal workforce? In the U.S., we’re still at a point where urging the embrace of human dignity by our systems of employment relations may get you branded as a left-wing idealist who doesn’t understand the market needs and competitive values of the modern workplace. But what if we elevated human dignity to its proper role in society, including making it the framing concept for how we govern the workplace? At the very least, what harm can it do to imagine the possibilities? Hicks invokes my friend and colleague Evelin Lindner, founder of the Human Dignity and Humiliation Studies Network, which I have mentioned many times on this blog. I explore some of the legal & policy issues related to dignity at work in “Human Dignity and American Employment Law,” University of Richmond Law Review (2009), freely downloadable here. Our avocations and hobbies: The third pillar of work-life balance? Let me add a third pillar to our model, that of avocations and hobbies, which can be sources of considerable satisfaction, especially when work and home bring more stress than balance. I am beginning to believe that our avocations will save us, personally in terms of enriching our lives, and publicly in terms of contributing to the greater community. The Merriam-Webster Online Dictionary defines an avocation as “a subordinate occupation pursued in addition to one’s vocation especially for enjoyment.” That’s a good start, but I want to add a few other qualities that separate avocation from a pure hobby, such as a sense of accomplishment and contribution to the broader community. A hobby may not result in a tangible something along the lines of many avocations (books, music, art, etc. ), and it typically does not break even in terms of monies spent. Nevertheless, it can be a tremendous source of personal satisfaction and a way to build community. If my Google searches are any indication (using “work-life balance,” “hobby,” and “avocation”), we link hobbies with the concept of work-life balance much more than we do avocations. The commentary on work-life balance regards hobbies as healthy release valves for the stressors of work and life. I agree; they allow us to lose ourselves in an enjoyable pastime. This is where many avocations enter the picture. They allow people to pursue a meaningful activity resulting in that elusive state of flow — one that may elude them in their working lives. Avocations typically are more than release valves from life’s pressures; rather, they offer our lives a different dimension. On this blog, I know that I talk a lot about improving work and creating better workplaces. But the reality is that for many, work remains an means to an end, rather than an end in itself. For those who harbor unrealized passions, the avocational route may provide deep satisfaction. I believe these third places in our lives are going to become ever more significant. They will provide us with outlets for pent-up creativity, some of which we can share with others. They will allow to do, collect, sort, feature, and make things that bring us satisfaction. In sum, they will help to give our lives meaning.